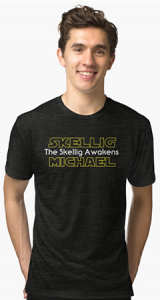 The Eco Tour is a non-landing tour of both Skellig Michael and Little Skellig. It’s a spectacular tour provided by one of SkelligMichael.com’s partner boat operators, Skellig Michael Boat Trips, on board the Lady Clare. The Lady Clare is one of only 15 boats licensed to also provide landing tours to Skellig. For further details on the tour, please click on the ‘Info’ button below. The price of the tour is 40 euros per adult and 25 euros per child.